Since the very beginning of history, people have been amazed by what they see when they look up at the sky. Indeed, looking at the celestial sphere without the unpleasant interference of city lights is magnificent. It can sometimes mesmerise us with a deep desire of traveling out to these celestial spheres to directly experience what our eyes cannot see. Human imagination has no boundaries, but the universe is infinite! However, most ancient civilizations have viewed changes in the sky with great fear and apprehension. Comets, meteor showers, supernovae, lunar and solar eclipses were viewed as bad omens by most societies. The Sun and the Moon are the main actors in the celestial theatre, the former being vital for life on Earth. The Moon, by its turn, has served as special inspiration for poets, writers, and lovers. The Sun and Moon have also been associated with religion and mythology, and sometimes regarded as gods with influence on the destiny of both societies and individuals. 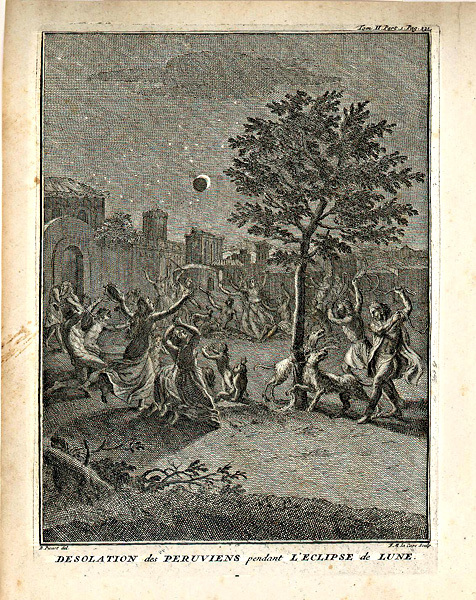 "Desolation des Peruviens pendant L'Eclipse de Lune. Voyage Historique de l'Amerique Meridionale." The Spanish explorer Don Juan described the Peruvians' despair during an eclipse. Source: The Philadelphia Print Shop Ltd. Solar and lunar eclipses were usually regarded as a disturbance in the natural order of the sky - as an indication that something was going wrong. Many historical events coincided with solar or lunar eclipses: battles, crowning or dethroning of emperors, peace treaties, and so forth. It is our nature as human beings to attribute meaning to events by whatever history, tradition or thought is available to us. The same is true for eclipses throughout the centuries. Unlike comets, which for a long time were regarded as unpredictable events, eclipses were accurately predicted at the earliest stages of mankind's history. Early astronomers were able to predict eclipses by around 2300 BCE. Their predictions were based on empirical relationships, governing the recurrence of events by which the relative positions of the Earth, Sun and Moon reoccur the same way after 6,585 days. The existence of a regular eclipse cycle, such as the Saros cycle, resulted from these coincidences involving complex combinations between the movements of the Moon, Earth, and Sun. This more detailed knowledge of eclipses started to be acquired during the second century BCE, the golden age of Greek astronomy. But the general population did not understand these relationships. As governors began to realize the influence astronomical phenomena exerted over the population, they used this knowledge as an instrument of power to influence people's psyche. The population would follow rituals and say prayers in order to prevent the supposed dire effects. Governors wanted to pretend they could influence the obscure powers involved, and likewise, astrologers and astronomers sometimes attempted to use their knowledge to manipulate and influence governors. A negative or positive correlation with an eclipse could affect the outcome of a battle. Only in the last five hundred years or so, or certainly since the invention of the telescope in 1609, have we come to understand these cosmic concurrences primarily in terms of the natural order of the universe. As previously mentioned, these events are no longer feared, but viewed as singular opportunities to better understand the universe. In this series of articles on Astronomy Today, we present some important solar and lunar eclipses throughout time and their impact on people, societies, and science.